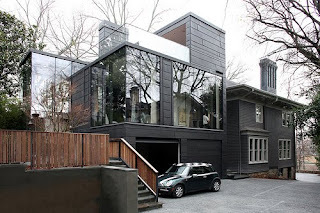 I stumbled upon this fabulous modern addition to a typical residential house in an historic area near downtown Atlanta and was mesmerized by the shapes and the light. 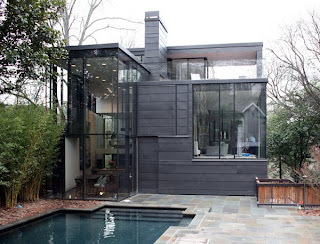 Designed by architects Brian Bell and David Yocum of the modern architecture firm bldgs, the Ansley Park Glass House is a stunning space that neatly juxtaposes the 20th and the 21st centuries. There's a cool pool to beat the Atlanta heat - its shape echoes the square lines of the new addition - and the original 1910 building. 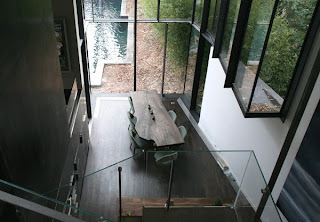 The living space is open inside, while walls of glass flood the rooms with light. 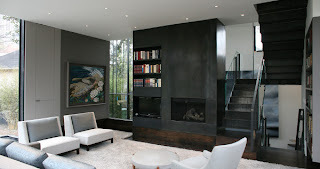 I love the soft grey-blue tones of the MCM furniture that contrast with the dark fireplace/bookshelf. A view from the suspended staircase: Dark woods on the walls and floor give a solid feel to the space - how fabulous is the Nakashima-inspired table paired with the Saarinen Executive Side Chairs? 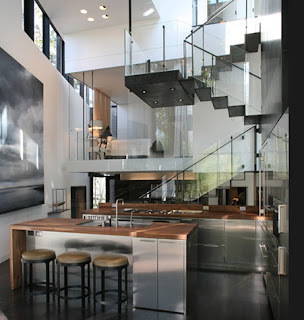 Possibly my favorite part of the renovation, the kitchen balances cool stainless steel cabinetry with warm wood countertops, where the staircase floats behind like a transparent sculpture - awesome. 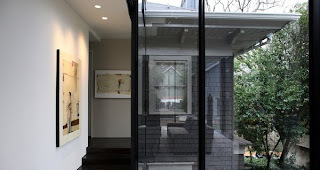 The square roofline of the original house seen through the rectangular wall of glass: the harmonious synergy of historic and modern. I love that combination! It's a delicate balance to add to a building, especially one that has some history on it. From what I understand, that house was the biggest hit on the Atlanta "modern" tour. Ansley Park is the least likely place for it: an old gentry neighborhood. It has everything, including over the top modern homes and renovations. It makes for way above average house stalking. Ah! Stunning is right. Wow!